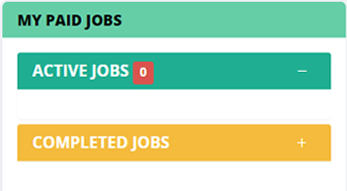 This is where you will find projects for which you have hired voice talent for a paid job. Your payment is kept on hold while you work with the voice actor to complete the recording. This section is where you will find any mass Castings you hold, and also Private Auditions of individual talent. 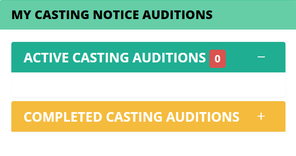 Once a Casting or Private Audition is closed it will be moved to the COMPLETED tab in this section as well. If you find a voice you like while browsing our database that you want to save for later, this is the place you will find them. 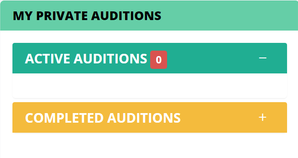 Once in this list you can either Group Audition talent, or Private Audition them individually. Not sure exactly what you're looking for? You can easily browse our talent database of over 5,000 professional voice actors. We've got over 100 languages and dialects from all over the world. Hand picked & ready to record! Here you can refine your search and drill down into our database to find exactly what you need. You can find talent who are 'In Studio' right now, search by keyword, and find talent who can come into your local studio. On a tight budget? QUICKcast is for projects for users that aren't too fussy, as long as the voice is a pro. You still get to choose the talent Gender, Age Range, and Language. You'll simply get a choice of 5 actors who you can then select from. If you ever get locked out, or forget your password, this is the place to reset it and get back to business. If your account is locked after too many wrong entries, you'll need to contact support to unlock it. We care about your security. Here you can change your email address, add a TAX/VAT number, add your company logo, adjust your timezone, select your currency for invoices and much more. Also add a second email address for invoices and notifications to be sent to. To save time when hiring voice actors, you're able to store your credit card safely, making the booking process as seamless as possible. We never have access to your credit card number, and all transactions are processed securely. All your payments will be kept together in this section. We are presently in the process of adding more features to this section, including the ability to search using keywords and sort via years. Any project where you have hired a voice actor and made a payment deposit will be easily accessible here. It clearly shows projects that are still active, and also those that are completed where you can go back and download audio. Private Auditions are where you hand pick which voice actors you want to work more closely with to find out if they are a good fit for your voice over recording. Voice actors will supply a FREE sample of up to 30 secs of your script. Casting Notices are a quick and easy way to get many voice actors record a FREE short sample of your script. From the submissions you are able to share samples of all or only your selected voice talent with colleagues and clients.